As I look out the window I am acutely aware that the six months of gray skies, cold temperatures and precipitation of some sort has begun. It is 15 degrees, everything is dim, and snow is spitting from the sky. And to think that just days ago I was surrounded by golden sunlight, endless blue sky, plum colored mountains and rolling golf links surrounding a graceful resort, several shops, a few restaurants and a lovely new spa. 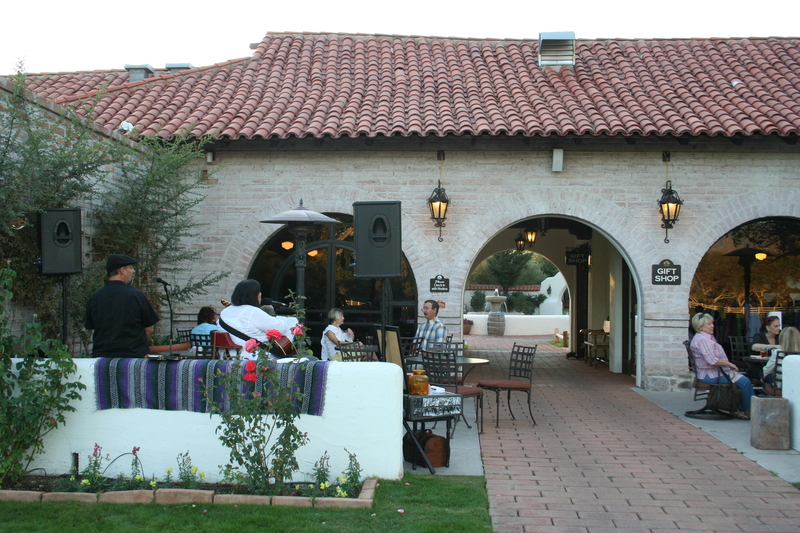 This is Tubac, Arizona. Every morning we woke early to the warm breezes of an Arizona day. We walked out of our suite, and into a small village area where the scent of fresh bacon in the breeze brought us to the sunny breakfast room. 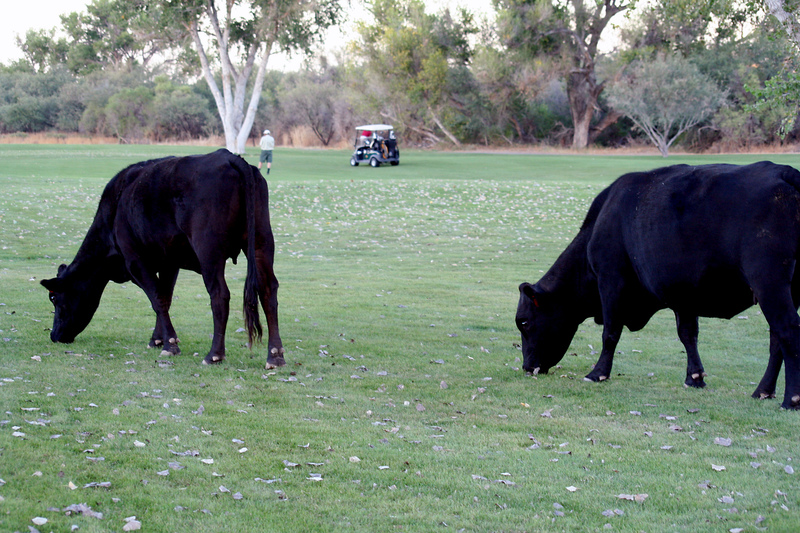 We usually chose to sit outside and watch the brilliance unfold as cows wandered around the golf course and waiters brought fresh healthy things as we considered our options for the day. One morning we crossed into Nogales, Mexico for a bit of bargaining in the shops. Mexican traders will drag you in off the streets saying “You are my first customer of the day, special discounts. Almost Free”. They are shameless flirts, will offer you tequila “made by my uncle” and give you small gifts for purchasing with them. If they don’t have the size of something you like, they will dash out into the street, haggle with another merchant, and sell you his product. They offer advice and suggest restaurants as long as you promise to return to their shop later. Go ahead, be shameless too. It’s fun and it’s the Mexican way. One morning we rode bicycles down the short dusty road into Tubac. What a delightful little town spanning the range from Mexican hand crafts and traditional work, to stunning contemporary artistry. We had lunch at a fresh air bistro enjoying fresh Mexican cooking and the exotic wind vanes of another artist bending the light gently in the soft mid day breeze. Jewelry, leather and clothing of all types and price ranges was to be found in southwestern buildings, adobe shacks and modern lofts off the dusty streets. Another morning we played golf on the beautiful course that surrounds the entire village resort. 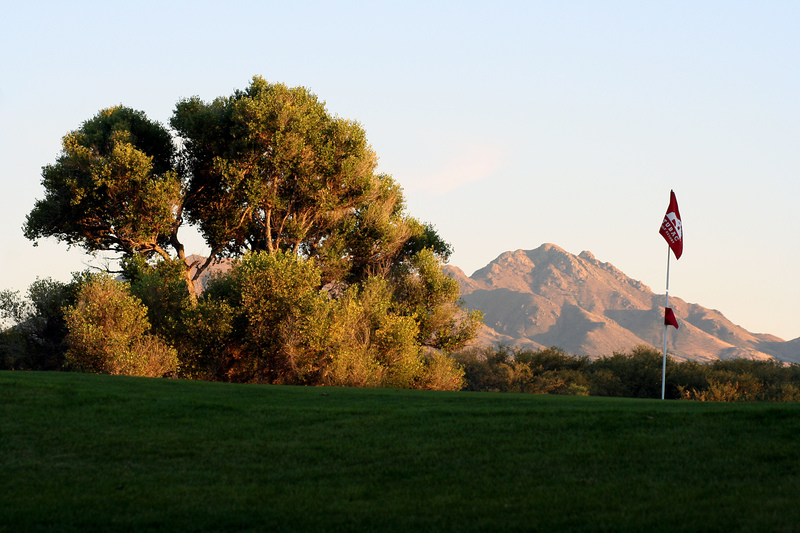 The course is a beautiful rolling landscape that surrounds the houses, hotel suites and inner village of the resort and is itself surrounded by towering purple mountains. Its most interesting feature to me was the ever present “girls” grazing next to the greens. They are practically pets right up until they become a fresh part of the restaurant menu, tender and delicious right off the hoof! 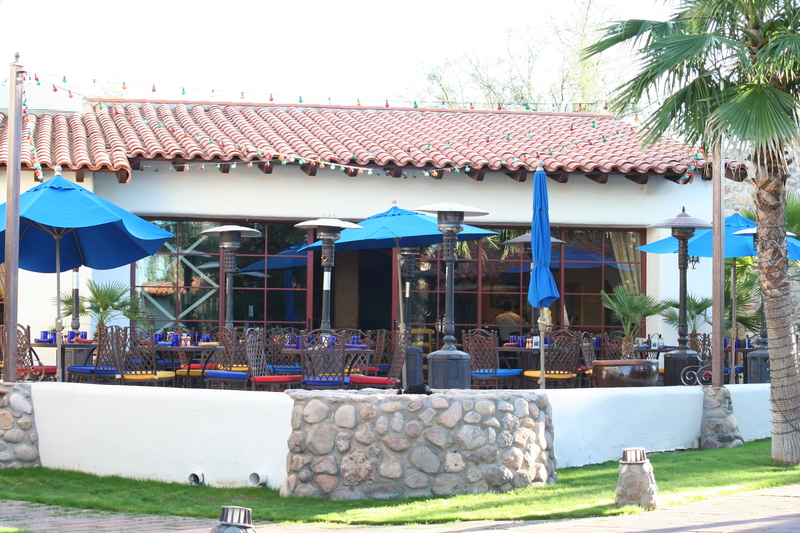 Every afternoon at the Tubac Resort, we went to the new spa, a lovely tile and mesquite building with tall windows and a balmy solarium in the center of the resort village. Treatments are perfectly designed to sooth sun drenched skin and golf tired muscles. Wonderful gentle falls of water ran down the walls infusing the air with moisture and the relaxing sound like very gentle rain. Pitchers of iced water filled with limes were at hand before and after treatments as we sat in cloud soft robes. My first treatment was called Tui Na. Sara’s strong hands soothed the whole length of my body. She infused the air with different aromas blending calming herbs with long smooth strokes and greener scents with deep tissue work. Interesting guitar music softly filled the room to stimulate several senses at once. For 80 minutes this process eased from quiet and peaceful to energizing and back to soothing. The end result was a head to toe body hum that lingered for days. Another afternoon I had one of the most refreshing facials that I have ever had. 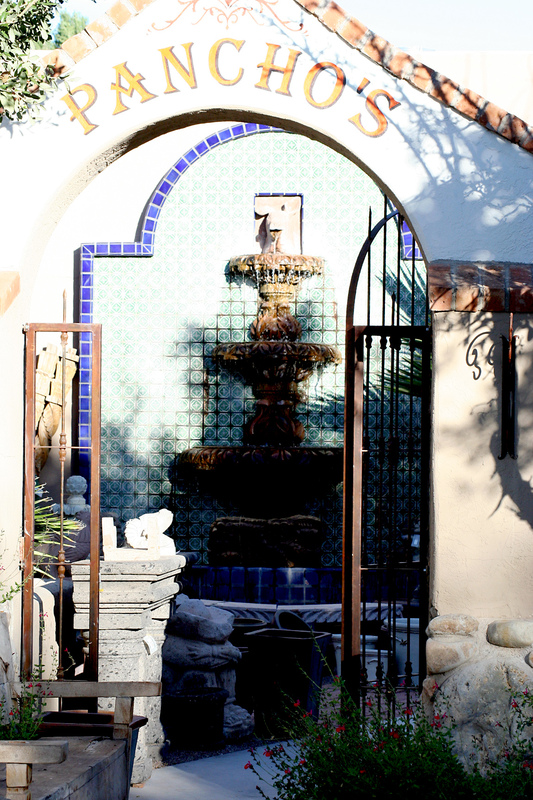 We had learned to come quite early to enjoy the ambiance of the spa and the comfort of the solarium before treatments. The spa room was as calming as I had found it the day before. Today though, I was offered a choice of scents for the air and the cleansers and lotions. I chose something light and floral which just barely lingered all evening. The treatment itself was soft and smooth and left my skin feeling calm and soothed, very nice. 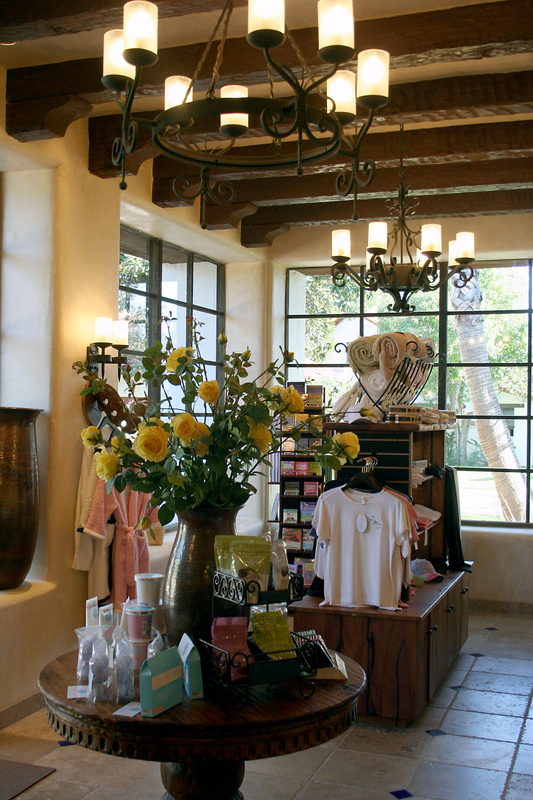 There are very nice shops at the resort as well as in the town. We bought clothes there to remind us of the delicious stay in the purple mountains of southern Arizona. We enjoyed every minute of our time at the Tubac Golf and Spa Resort, and as I turn to the window again, I can barely believe that I left. My mind takes a small holiday into the possibilities of staying out there for the winter….. It’s pretty easy to get to though, so I might just have to go back before the daffies start emerging!